Define site-specific business rules to cater to different ticket processing mechanisms across all operational sites of your organization. Configure multiple criteria to perform custom actions on incoming tickets. 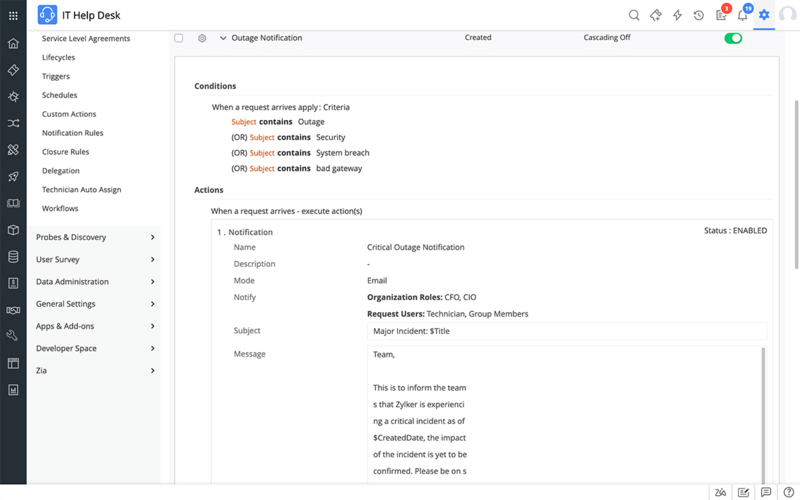 Prioritize and categorize tickets, set urgency and impact, and assign tickets to technicians or support groups, based on the inbound ticket parameters. Execute business rules on ticket creation or ticket updates. Manage multiple worklflows by cascading the execution of business rules. Notify technicians with custom emails and text messages when a business rule is executed. With business rules, we have been able to ensure that tickets are handled by the right teams, ensuring faster resolution times for end users.